I seriously doubt this is true. Rogoff & Reinhart have observed that the US government employed financial repression after WWII, and further, that FR utilized the power of the central bank to suppress artificially the real rate of interest. The Fed did this via Reg Q and by keeping the short term rates below the rate of inflation. The fact is, it worked, and this was not a mere theory, it paid off the entire WWII war debt. So yes, the Fed can suppress the real rate, and in fact, has done so many times. “Because the growing financial markets absorbed much liquidity, inflation rates remained stable since the 1990s despite a downward trend in real and nominal interest rates” (p.15). Having read your enlightening post, I am even more puzzled by their statement than when I first read (and re-read) it. Surely, if both nominal and real interest rates are declining at similar rates, that rather requires inflation rates to be fairly steady? See your graph. Is the confusion over interest rates that Scott Sumner regularly complains about (that low interest rates are generally a sign that money has been relatively tight, high interest rates that it has been relatively loose), even though cutting rates generally represents an easing of monetary policy, at work here? I.e. is confusion between the difference between a change and a level operating here. Excellent post. The Fisher Equation is such a simple idea yet so essential to properly understanding monetary economics. implies that there is a variable P of which you are taking a time derivative. In the ex facto version of the equation, this clearly correct. As you say, the equation is a definition of the real rate of interest and has no possibility of ever not holding. where r_e is the expected real rate of interest and I_e is the expected real rate of interest. Note that i is, as before, a directly observable quantity and isn’t any sort of expectation. This equation too is a tautology, however it is underdetermined – how do we determine how to separate i into r_e and I_e? This allows us to determine all the quantities, but is certainly not very interesting. Presumably there is a time lag in equilibrating r with r_e, but, one would expect, in the long run, this equation would hold as well. And it’s not as if that bet has swung positive over the last 60 years. The Fed cannot control real variables in the economy. Like unemployment. The Fed can control nominal variables. Two of these are the s.t. interest rate and inflation. The combination of both yields the s.t. real interest rate. Thus, the Fed determines the s.t. real rate. Whether, or how, the Fed controls the l.t. interest rate is a matter of debate. Some argue it does so by adjusting the expected path of the s.t. rate, but the influence of this is likely slight beyond five years or so. Others claim QE influences the term nominal rate via the portfolio balances effect. Woodford has his doubts, and they are good ones. People like me claim QE influences term nominal rates due to financial frictions: agency effects that incentivize speculative strategies such as carry and frontrunning. These allow the Fed to temporarily influence term rates. Of course, if the Fed can control inflation expectations and influence term rates, then it influences the term real yield. Of these explanations, the only one that accounts for the performance of all asset classes since 2009 is the last one. The other explanations for declining real rates are incompatible with rising stock prices. The gold lease rate could be called a real interest rate, along with a lot of other real rates that are set when people borrow a commodity and pay interest in that commodity. A composite of these commodity interest rates would be very close to a true real interest rate. Thought: We have a globalized economy, capital moves across borders by keypunch. Plus there is a couple trillion in cash floating around globally, all denominations. And the Fed is setting long-term interest rates? Really? It seems to me when I see austrian/hard-money-types refer to the idea that the FED is holding nominal interest rates “artificially low” and below some “natural rate of interest” it seems to me that they must not be considering the “Real Interest Rate” as we might delineate from the Fisher Equation, to be the “Real Interest Rate”. I’ve seen this in various commentary at Forbes, CNBC, Twitter, etc. Upon what foundation might these folks be grounding their idea of what the “natural interest rate”??? It often seems like Austrian/Hard-Money Types act like the FED is artificially holding nominal rates lower than some natural rate of interest…but per the Fisher Equation it seems like the Real Interest Rate is often lower than the nominal rate. Where are they getting this? This is only a paradox if you believe that central banks really do have the ability to always control the rate of inflation. Fisher’s theory is based on the notion that inflation is endogenous which seems to account for some of the current misunderstanding of the problem. Mankiw’s comment in 2006 that inflation fell in those countries that targeted inflation as well as in those countries that didn’t target inflation highlights the issue presciently. This is not to argue that under certain conditions central banks cant influence the rate of inflation (Volcker in early 1980’s), but rather that there are other dynamics at work in the system that central banks cant control such as exogenous productivity shocks. Your explanation of the fall in the real rate holds water. But it’s strange that a repricing of real rates for a US-as-Japan scenario would not also be associated with falling inflation expectations – a US-as-Japan scenario with 2% expected inflation. The episodes of steeply falling inflation expectations that preceded QEs 1 & 2 and Op Twist were associated with steep declines in real rates; both markets repriced for a US-as-Japan scenario. QEs 1 & 2 and Op Twist reversed the declines in inflation expectations. The puzzle is the hysteresis in real rates. I attribute it to stop-go monetary policy; the pre-QE3 unconventional easings were seen as transitory interruptions on the path to a US-as-Japan scenario. 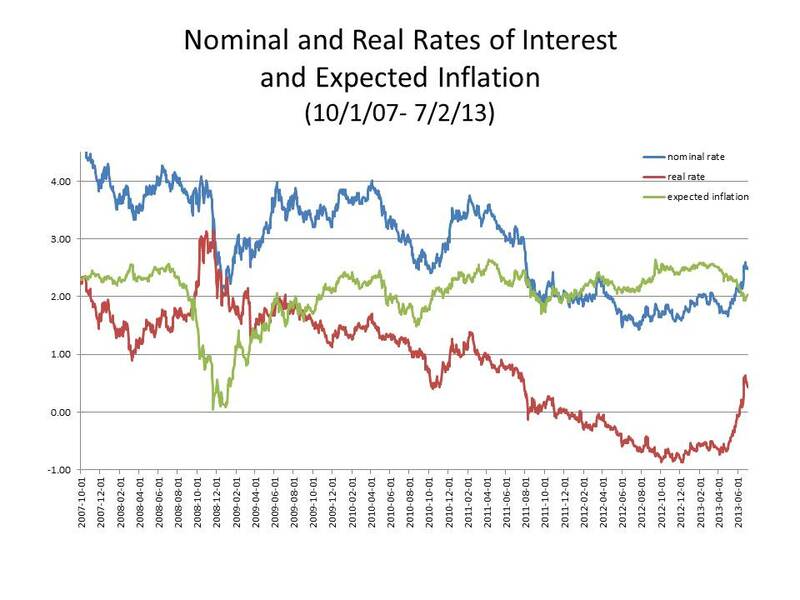 QE3 ended stop-go (even if it didn’t eliminate discretion) and real rates are normalizing. First, I think that you misuse the world “neutrality” here. Everybody knows that bad government policy (including bad monetary policy) can have adverse impact on real variables like unemployment and real interest rates. … only sometimes bad Monetary policy has real impacts – for instance it reduces the real interest rate – which means no “overriding” of nominal interest rate set by central bank by “fundamental forces” – or to be more precise, central bank is large part of these fundamental forces. maynardGkeynes, I was not talking about what the Fed did years ago, I am talking about what it is doing now. Regulation Q no longer exists. What is the “financial repression” that is now being exercised by the Fed? W. Peden, Thanks, I agree that the Fisher equation is essential. It is at least as important as MV=PQ. Mitch, I’m not sure if your problem with notation is with mine in this post or with the notation of the Fisher equation in general. I agree that, given the nominal rate of interest, there is nothing in the Fisher equation that determines how to divide the nominal rate between a real rate and an inflation rate. That’s why I pointed out that the common practice of many economists is to assume that the real rate is determined by “fundamentals.” That, I believe, is a workable approach only under special circumstances. In other words, if monetary policy affects inflation expectations, there is no guarantee that it will not also affect the real rate of interest. Frank, So, let me understand. Are you saying that “you believe that you can entice consumption in excess of production funded with new debt,” and that “you believe that the Fed cannot reduce the rate of unemployment below the natural rate of unemployment?” I also can’t tell what is being measured in the graph that you link to. Diego, Following your reasoning, couldn’t one say that the Fed can control nominal GDP and the price level. The combination of both yields real GDP, and real GDP determines (un)employment. So the Fed can control unemployment. I maintain that the Fed can control the short-term nominal rate only because the short-term real rate is negative. If the real rate were not negative, the Fed could not enforce a zero short-term nominal rate, because the rate of inflation and inflation expectations would quickly rise. I don’t dispute that there may be financial frictions such as you describe, but I think those effects are second-order. But having said all that, if you or someone else has a discussion showing that financial frictions provide the only explanation accounting for the performance of all asset classes since 2009, I would very much like to see it. In the meantime could you explain – an I apologize if I am asking you to repeat yourself – why declining real rates are incompatible with rising stock prices? Mike, Where could I go to look at the gold lease rate? Cory, Some of my best friends are not economists. You are asking exactly the question to which I am seeking an answer. I think that there may be an implicit assumption that there is a kind of natural or praxeological law that interest rates are necessarily positive. I think that Mises in Human Action tried to provide a proof that the “originary rate of interest” (never understood the meaning of the adjective) has to be positive. Of course what constitutes a “proof” for Mises would not necessarily constitute a proof for ordinary mortals. Based on my reading of Mises, a proof was essentially any belief of his for which he could provide some sort of minimally plausible argument. So for hard-core Austrians, it would simply be a non-starter to entertain the possibility that there could be a negative real interest rate, because that would contradict a theorem “proved” by von Mises. A zero nominal rate could therefore only be achieved by means of interference with the free market which, based on the theorem “proved” by von Mises, would never allow the real rate of interest to be negative. Tom, On what do you base your assertion that Fisher’s theory is based on the notion that inflation is endogenous? I agree that inflation in any country is influenced by both internal and external factors, but that doesn’t mean that the monetary authority in any country could not, within some range, control the rate of inflation in that country. I do agree that Leijonhufvud’s book is superb, and deserves to be read more widely than it has been. @ David: Short term rates have been below the rate of inflation for some time now, which is precisely the state of affairs the Fed has sought to bring about. I call that Financial Repression. Perhaps you are arguing that they would be that low anyway, but that is not what the Fed believes is the case, and I am inclined to take them at their word. Here’s a link for gold lease rates. JP Koning also had some interesting stuff to say about the gold lease rate over at his ‘moneyness’ blog. An endogenous view of prices also comes through in Fishers’ 1926 article, a statistical relationship between unemployment and prices changes which is the same basis for the Phillips Curve. This Ed Nelson paper on endogenous views of prices is useful. Interestingly if you take a closer look at Phillips data set, the relationship breaks down when inflation and deflation is imported – something that was conveniently forgotten. Phillips accepted the case for imported inflation and tried to argue that the relationship didnt work in the 1870’s because of a data anomaly caused by n index calculation. But this was bang in the middle of a period of falling prices in the UK. Your question: “Are you saying that you believe that you can entice consumption in excess of production funded with new debt?”. I am saying that if you believe that the Fed can reduce the real rate of interest below the “natural rate”, then you believe that the Fed can entice consumption in excess of production by lowering the nominal market rate of interest on existing debt. maynardGkeynes, What I am suggesting is that if the Fed can drive down the real rate of interest, it’s only because the underlying conditions in the economy allow it to fall to that level. If the economy wree at full employment and the Fed tried to drive the real interest rate below zero, a real reaction would set in that would frustrate the Fed’s attempt. If the Fed is succeeding it’s only because the real economy can tolerate such a low rate. A normally functioning economy would not tolerate such a low rate. Mike, Sorry, but I need help making sense of the different graphs on the link that you sent me. But I think that I get the basic idea. Tim, QE3 started last fall, the rise in real rates only began in the spring. How do you account for that? Tom, I don’t get how imported inflation leads to falling demand and falling prices. I also don’t think that I really understand what you mean when you say that inflation is endogenous. Frank, Sorry, but I am now hopelessly confused. David, I surmise that the “real reaction” you are alluding to would be CPI inflation. However, the form that inflation takes in an economy where wealth and income distribution are so skewed toward the top is not traditional CPI inflation, but inflated asset prices, which is what we are seeing. One can debate why that form of “inflation” is so well tolerated by the economy, despite its distortionary effects, but I suspect it has a lot to do with who has benefited by it, namely, the people who own the inflated assets, who tend to be relatively (and in most cases absolutely) well-off, and who are now even betterl-off than before. Before QE3 risk-on, risk-off was the “right” way to think about financial markets. Correlations among risky assets were high because of the single source of volatility, US monetary policy. That changed with QE3. The correlations broke down. It took people time to appreciate the implications of well-supported inflation expectations. MONETARY POLICY” in the Ed Nelson paper, he states that Friedman argues that exogenous price shocks can only have transitory effects that hardly matter for expectations. So I think the more interesting question is therefore to what extent was Fed policy driving the roughly constant 2% inflation expectations versus exogenous factors? Friedman and Taylor discount exogenous factors but I am less convinced that the bond market ignores exogenous factors. Philips’ work here is I think interesting. Re: export and import of inflation, see p.92 on Connecticut. My interpretation is that this is his long term view of a tendency towards monetary equilibrium where international and interlocal trade will produce an adjustment of price levels towards uniformity. One aspect of the above conversation I always find so difficult to follow is the use of several words for the same idea. Natural rate and real rate, for instance, are often used interchangeably. Splendid post, although I’m a few weeks late reading it. The credit markets are not homogenous. Frank, is this Fisher’s definition of the natural rate of interest? If so, could you send me the reference? I’m interested in general where this kind of confusion arises in the history of economics. There is a large body of thought from Bohm Bawerk through to Wicksell, Hayek, Myrdal and to an extent Keynes (although he is more careless in his terminology) that argues that the natural rate of interest is the income returned to the owners of capital determined by the marginal productivity of that capital. JP: Your definition of nominal rates is not standard parlance. This is particularly true in the case where it matters, TIPS vs. Nominal Treasuries, i.e, riskless rates. The spread is accounted for entirely by inflationary expectations, with slight distortions caused by liquidity and IR uncertainty premia. maynardGkeynes, CPI inflation is not the real reaction that I have in mind, but it is a likely result of the real reaction. It is not clear to me why only economies with evenly distributed income are vulnerable to inflation, but I have to admit that I haven’t studied models in which income distribution is a critical to macrodynamics, so I may be missing something. Tim, Why do you assume that QE3 is the cause of riskiness rather than some other feature(s) of the underlying economic situation or some other element of policy? Tom, It seems to me that what Nelson and Friedman mean by exogenous price shocks is a shock to a particular price, e.g., an oil price shock, which would only have transitory price level effects unless monetary policy was used to nullify the price shock by imposing a price level change to restore the pre-shock real price of the affected commodity. The question then is does the market anticipate that monetary policy will accommodate a real price shock or will remain committed to a particular price level or inflation path. I don’t see a page 92 in the PDF you linked to. JP, Thanks for the kind words and for the link. The way I think about it is that the real rate is simply the nominal rate adjusted for some measure of inflation. The natural rate, as it has been used since Wicksell, involves some notion of equilibrium. Thus, to the extent that the Fisher equation is an equilibrium relation (which is the more interesting way to think about it, otherwise it’s just an accounting identity), it is implicitly identifying the real rate with the natural rate. However, there is still Keynes’s view that the equilibrium real rate is a function of the level of employment and different real rates correspond to different levels of employment (though Keynes didn’t work out the relationship, a major gap in his exposition). That’s not an exhaustive taxonomy, but it gives you some idea of the way you could make the relevant distinctions. Frank and Tom, That is certainly one way to distinguish between the real and the natural rate, but I don’t think that your distinction would reflect the usage of the terms in the economics literature. maynardGkeynes, I think you mean to respond to Frank not to JP. David, the reference was to Fisher, Purchasing Power of Money (Chapter VI). Not sure if the page numbers are the same for different editions though! I agree that there is a great deal of divergence between many modern economists’ terminology of the natural rate (largely influenced by Friedman) versus Wicksell’s initial description of the natural rate. In chapter 8 of Interest and Prices, Wicksell defines it as the “natural rate of interest on capital”. Wicksell stated that the data required to calculate the natural rate on capital could be extracted from company accounts. In essence, Wicksell’s theory is a macro one based on micro foundations. Wicksell’s definition was central to the Stockholm School’s view as well as Hayek. It’s interesting that Leijonhufvud describes in Information and Coordination how Wicksell’s theories also influenced Robertson and the great Hawtrey himself. Of note is that Fisher and Friedman remained outside his sphere if influence. (So the divergence should not be that surprising) Chapter 4 of my recent book discusses this in quite a lot of detail if you are interested. David, This may be a failure of imagination on my part but QE3 is the only thing I can think of that explains the breakdown of Risk-on, Risk-off after the third quarter of 2012. The breakdown seems obvious to me from the quarterly performance of broad asset classes — developed market equities, emerging market equities, emerging market US$ credit, the US$, gold and US Treasuries. You are forgetting about early repayment risk. Do the interest rates on government securities take into account the possibility of early repayment (budget surpluses)? Technically, this is a default and can create some real problems for entities trying to match the duration of its assets (government bonds) with the duration of liabilities (pension / retirement funds). The money rate of interest is the interest rate received by the lender, not the stated interest rate on the loan. The default premium can be positive or negative. And so, with regard to TIPs versus nominal treasuries – if a government decides to run a surplus which securities are retired early and do the interest rates on those securities adequately reflect the potential for early retirement? @Frank: Not sure I follow. Since 1985, US Treasury bonds have been non-callable. There is no early payback risk as far as I know. On U. S. Treasury bonds, I understand that the U. S. has not issued any since 1985 which leaves me wonder if there are any 1984 vintage 30 year callable bonds floating around out there. Also, does the non-call feature of U. S. Treasury securities hold up under international law? Domestically a bank / pension fund / etc. could conceivably sue the federal government for breach of contract if it tries to buy back its debt before maturity. Can the same thing be said of international holdings? What I am getting at is just because a government says it won’t do something does not mean that it really won’t. Do you think that the source of confusion is either deliberate attempt to ignore or lack of realization of the fact that (by the WSJ contributors you refer to), as you notice, the Fed has so much power right now precisely because the real interest rate is below 0 and that things get a bit different? If so do you think it is just a part of a larger narrative and this is just a convenient opportunity to advance it? Ilya, My own view about your question is purely uninformed speculation, so there is really no point in sharing it. But since you ask, I will just say that the arguments I am criticizing seem to me to be motivated largely by political opportunism. People tend to reach for whatever arguments will work for them at the moment regardless of whether the arguments are consistent with other positions or arguments they have taken in the past. That’s just the way people are.